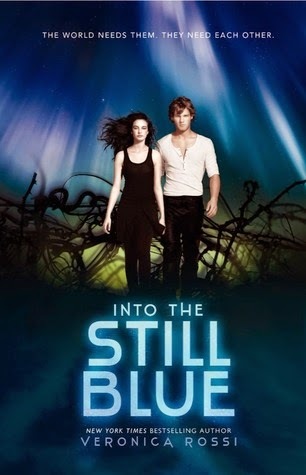 Into The Still Blue is the 3rd book in this YA trilogy that I have very much enjoyed. Its a different kind of spin on our world, when aether storms are controlling and burning up the land and different groups of people have been surviving in various ways. By the third book Aria and Perry are determined to figure out a way to save their people and get them across into the Still Blue. That is after they first figure out how to find the Still Blue. Dwellers and outsiders are forced to live together and now work together and this has not been an easy transition for any of them. Aria and Perry reconcile their differences and join up right from the start to find the answers they need. This third book is filled with a lot of action right from the beginning, which is nice. It had been a while since I read the other two books, so I'll be honest it took me a few chapters to fully remember it all. What I really liked about this book was it drew us back into the memories and things we liked about the first book when it comes to Aria's and Perry's love. Although it was a nice conclusion, the author did an excellent job reminding us why in the first book we fell in love with the characters. There are a few twists and turns, and a few things I had guessed would happen. On one hand we knew from the beginning not everyone would live, but who lives well you'll have to read it to find out. I found it to be a pretty fast read, and I really enjoyed how Veronica Rossi created a conclusion for each of the characters. Although I will not spoil the ending, I will say I really enjoyed it and when I finished I just thought, well done! If you enjoy YA and are looking for a fun action filled trilogy to read this summer I recommend the Under the Never Sky series, you'll love it! The best part is all three books are now out so you won't have to wait years like I did to find out how it was all going to end.